The story of Robert who died within days of the end of the Battle of the Somme when he was killed by a German prisoner he was guarding. 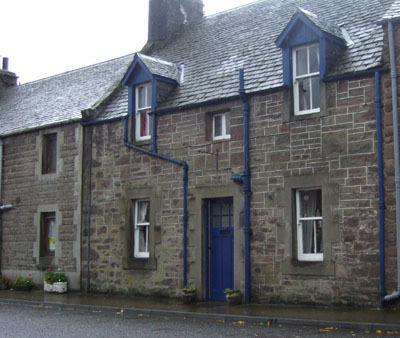 Robert was just a month old when he appeared on the 1891 census living at Lochlane Cottage, Monzievaird, Strowain, two miles from Crieff, with his parents and his five siblings, not to mention his 66 year old grandmother. Ten years later in 1901, Robert and the family had moved to Drummond Street, Muthill (photo of their house on the right). There were now seven siblings, including two under three. It must have been cramped to say the least ! Robert worked at the Carluke Steam Laundry as a boilerman, fireman, stoker. Presumably it was there that he met his wife, Catherine Pearson, who he married in 1911. They had a son and a daughter, also called Catherine, before he left for the War. 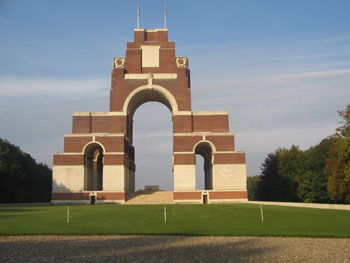 Panel Reference Pier and Face 7 D.
If the following story is true, why is Robert commemorated on the Thiepval Memorial without a known grave ? Information has been received this week by Mr William Sandeman, burgh roadsman, Ramsay Street, Crieff, that his eldest son, Lance-Sergeant Robert Sandeman, Scots Guards, was treacherously killed by one of a party of Germans whom he and other guardsmen were bringing in as prisoners of war after an attack upon the enemy trenches on 15th inst. The deceased had been in front of the party directing the way when he was shot from behind. He was a tall, well-built young man of 25, and prior to enlistment was a laundry vanman, employed for some years at Carluke, where his wife and child reside. He had been in the Army for nearly two years, but only proceeded to France about a month ago, having previously been retained in England as bombing instructor in one of the London training centres. Two younger brothers are also serving with the Colours. For an excellent synopsis of The 1916 Battle of the Somme see this link.